"Eisenberg’s Sandwich Shop -- Continuing Fine Quality Since 1929." In the hustle and bustle of New York City, it’s easy to rush past the unassuming facade of Eisenberg’s Sandwich Shop just across the street from the iconic Flatiron Building. And in a city that changes its profile with each rising skyscraper, it’s hard to believe that this classic lunch counter has escaped the developer’s hand and continues to serve up homestyle meals as it has since 1929. 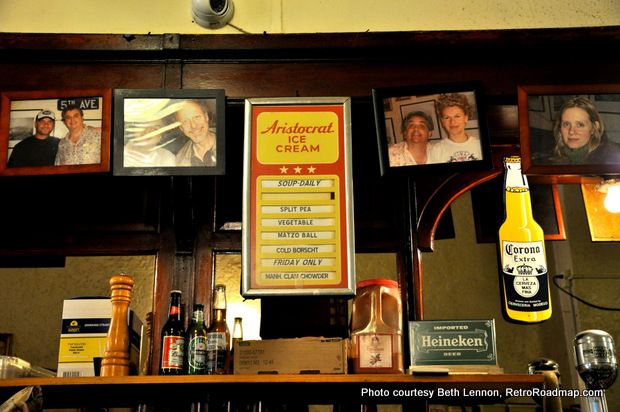 Step up to the counter and step back in time at Eisenberg’s. Step in from the frantic pace of the sidewalk into the entrance of Eisenberg's and slip through a time-traveler's portal into Old New York City. A Glenn Miller tune wafts through the air accompanied by the clatter of restaurant china hitting the marble counter. The red vinyl stools stretching back as far as the eye can see beckon you to sit a spell and prolong that back-in-time feeling while ordering from the menu of comfort food staples. Eisenberg's soup menu includes Matzo Ball, Cold Borscht, and -- on Friday only -- Manhattan Clam Chowder. 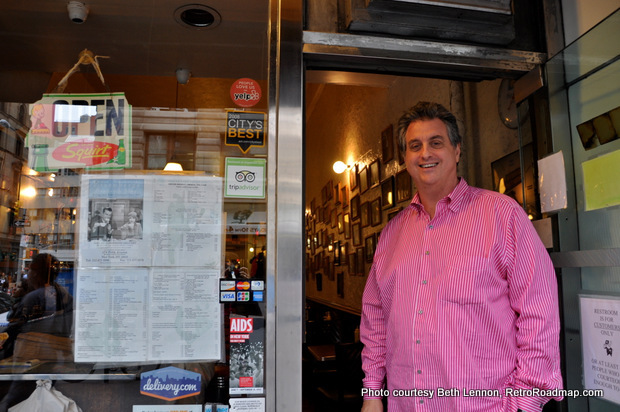 "There used to be a place like this every few blocks or so -- every neighborhood had one,” says Eisenberg’s owner Josh Konecky. “Now we’re the only one left." Owner Josh Konecky says of Eisenberg’s, "You either get it or you don’t." Konecky, who grew up just streets away from Eisenberg’s, has witnessed firsthand the rapidly changing face of the city. 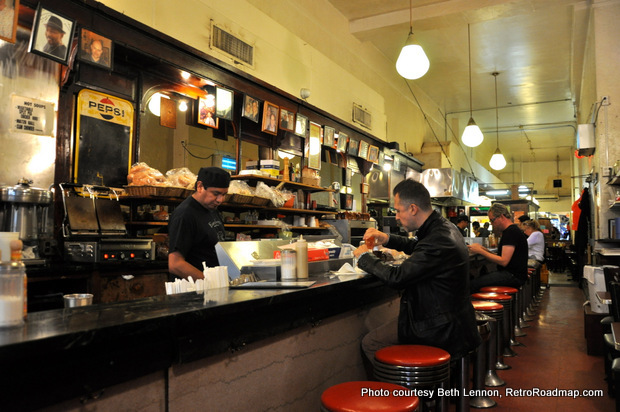 As a loyal regular of the lunch counter for many years and self-proclaimed preservationist, he knew he had to do something to save Eisenberg’s when it was rumored that the lunch counter may close. He is now only the fourth owner since the Eisenberg family opened the doors nearly 85 years ago. 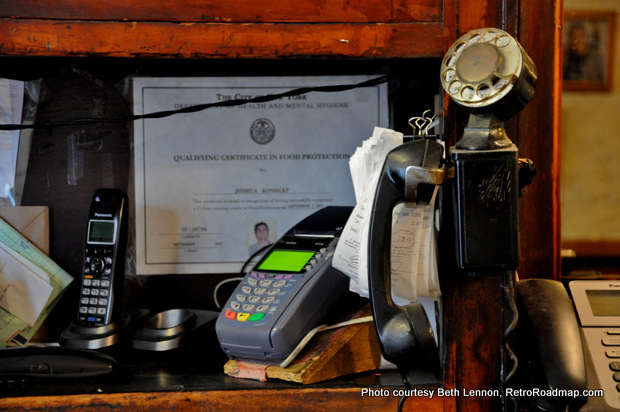 When paying your bill at the register, you may spy this still-operating vintage phone. Sandwiched between a smoothie stand and a high-end jeanery, Eisenberg’s is anything but trendy, which was a conscious decision on the part of Konecky. "You can go anywhere and get wraps and paninis," he says. But there are only a few places in the city where you can go and get a traditional egg-cream, pastrami, or classic tuna salad sandwich on white toast. 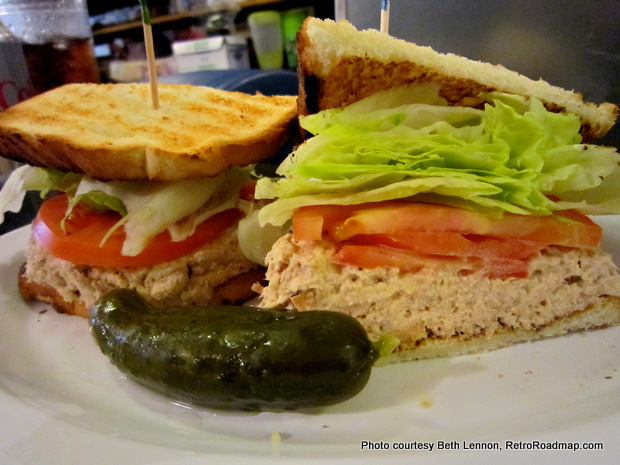 Eisenberg’s classic tuna salad sandwich -- just like Mom used to make. While counter space is at a premium during the lunch rush of local workers out for their midday meal, better yet is to visit during the less frenetic hours between mealtimes. 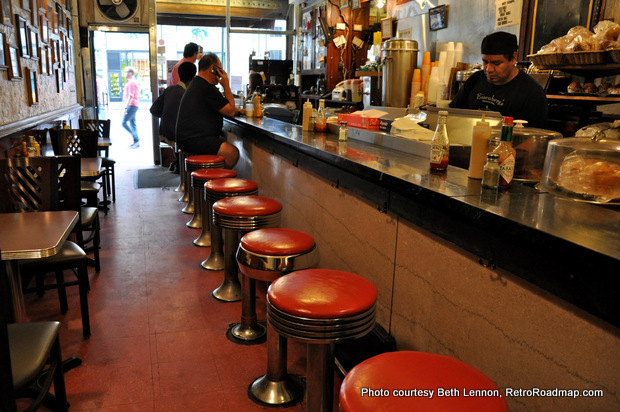 Then you can swivel on your counter stool while waiting for your bowl of borscht, pretending that you’ve slipped back into a previous era, when the Flatiron Building was still the tallest building in the neighborhood, and there was a lunch counter in every neighborhood. 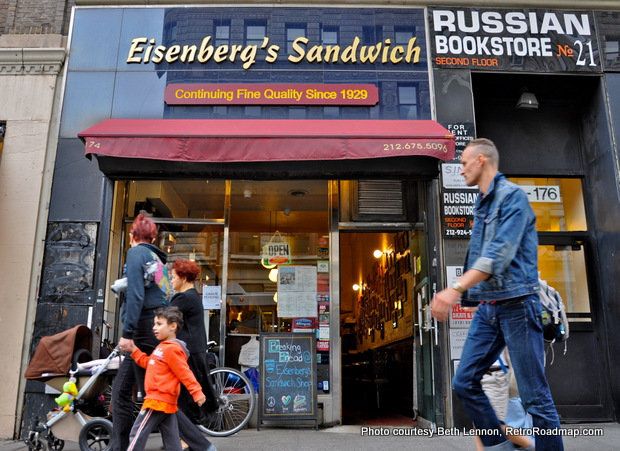 Time stands still at Eisenberg’s counter.